Shame. It's a powerful emotion and response to our feelings of inadequacy. I've not really thought long and hard about it before now, but I'm realizing what a weapon shame is for satan to use against us. When I was presented the opportunity to review "Unashamed", I jumped at the chance. 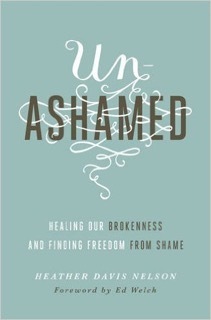 The book offers to shine the hope of the gospel onto our shame. Wow! That's a pretty hefty promise. And I'm pleased to say that Heather Davis Nelson delivers on her promise. I'm not generally a person who is afflicted with a lot of shame...but the shame I have is deeply rooted into my life, my heart and my spirit. I'm still a work in progress, but this book has shown me how I have bought into the lies that cause me shame and I'm learning ways to rid myself of that shame and move forward in a more productive life. 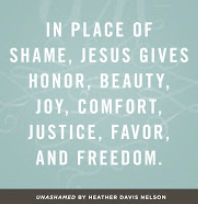 I was also fascinated by some of the ares of shame covered (body shame, social shame, shame in marriage) and the practical advise on how to help not only myself, but others in these areas. I don't have shame in all areas, but I know people who do. And learning how to love them and lift them out of their shame is as important to me as ridding myself of my shame. I'm still re-reading and meditating on sections of the book. It can be read quickly, but I'd urge readers to take their time. Really meditate and find ways to help yourself shed shame and pick up the hope offered to us through Jesus. I'm so excited to be able to offer my readers a chance to win a copy of the book "Unashamed". Enter below using the Giveaway Tools Form. 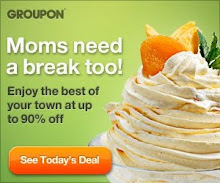 I like that offers HOPE to those struggling under the burden of shame. I would enjoy the words of encouragement from a Christian source. I eventually want to pursue a career in counseling and think this would be a great resource! I am interested in this book because this is something that I strive to be. I think the fact that this book uses religion to help self-heal is amazing and we could all use some self healing.